Do you know how much money you’re losing to shopping cart abandonment? Do you know how much more money you could be earning with an optimized checkout experience? The statistics don’t lie. The average shopping cart abandonment rate currently stands at nearly 70%. That means 7 out of 10 highly qualified leads – people who like your product enough to click “Add to cart” – are being lost during the checkout process for one reason or another. There is no better place to stop your optimization efforts than the checkout process. Today, we’re going to cover the most common reasons customers abandon ship during checkout and review the anatomy of an optimized checkout experience with the help of this incredible infographic from our friends at SurePayroll. Let’s look at some of the key takeaways for eCommerce store owners and optimizers. If your goal is create an optimized checkout experience, the follow points are a must read. There are a lot of reasons a given visitor might abandon your website during checkout. Using the data listed above, we can see some major themes about what most influences cart abandonment. According to consumers, the #1 reason for cart abandonment BY FAR is hidden costs that don’t show up until they have begun the checkout process. In a similar vein, the 4th most cited reason was that consumers were unable to ascertain the total cost of the transaction before starting checkout. What this tells us is that consumers want to know EXACTLY what to expect when they begin checkout and they absolutely do not want any new information thrown at them along the way. In some niches, costs like taxes or shipping might be expected and acceptable, while in other niches, they will be considered new information. In all cases, however, extra fees and other costs that aren’t disclosed ahead of time will often result in cart abandonment. As we see in the infographic, consumers hate complicated checkouts. They don’t want to create an account. They don’t want to fill in layers of unnecessary information. They don’t want to jump through 5 rounds of hoops. They want to pay you money, get their stuff, and leave. The longer and more complicated your checkout process is, the more primed buyers will cancel their transaction instead of paying you money. If you can’t complete checkout… you can’t complete checkout. Usability testing and eliminating errors should always be your #1 priority. It’s simple. There’s no guesswork or strategy involved. If you’ve been dragging your feet on this, you are literally throwing away money. Trust is a very important piece of ecommerce. Thanks to the Wild-West-like landscape of the internet’s opening decade, many consumers have a deeply ingrained level of mistrust towards any brand or website they haven’t already bought from. While the landscape is much cleaner today, and consumers have many levels of protection in place, those feelings of mistrust tend to surface during the checkout process. When it’s time to actually pay money, consumers want to be confident that they will get what they paid for. During this process, any signals that can cause skepticism will likely result in cart abandonment. Even just a lack of positive trust signals can be enough to cause abandonment. It’s important to plant a continuous stream of encouragement, proof, and other trust signals within your checkout process. Now that we’ve discussed some of the primary reasons consumers abandon ship during checkout, let’s discuss how to reduce abandonment and create an optimized checkout experience for your customers. One of the best ways to reduce care abandonment is to tell users exactly what to expect before checkout and then avoid springing new information on them during the checkout process. 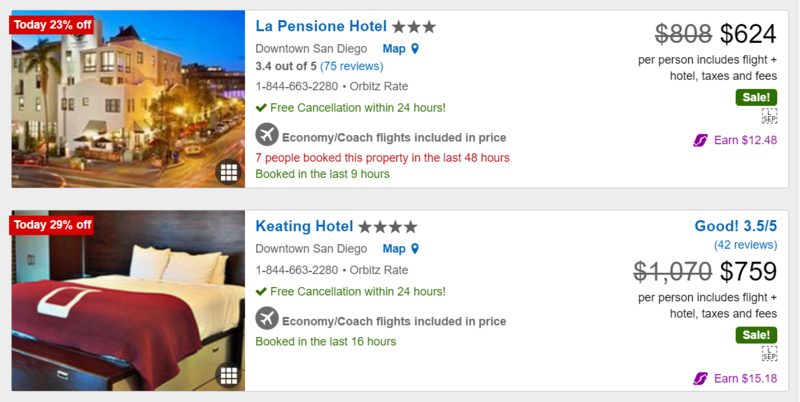 For some niches, this is as simple as including the full price on the landing page. For other niches, this can be more complicated. If the cost will depend on a future variable, then you can either clarify that a future cost is still on the table – “Shipping cost not included” – or you can change your business model to eliminate variables for the user. The checkout process should feel simple and intuitive. Sometimes there are unnecessary steps or requirements that need to be eliminated, but at the same time, putting everything on one page isn’t always the answer. 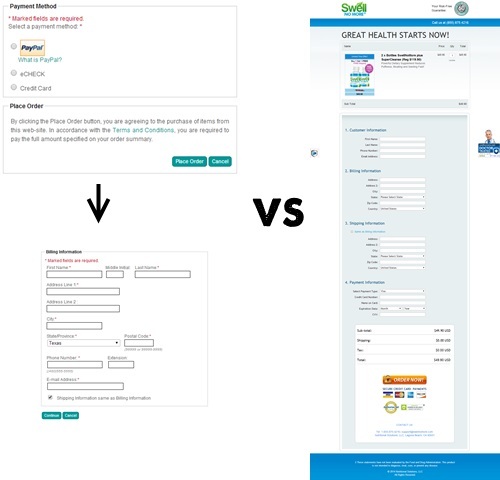 In the example below, the two-step checkout on the left converted better than the one-step checkout on the right. This is likely due to the one-page checkout overwhelming the visitor with 15+ lines of data to enter, while the 2-part checkout broke things down into more manageable sections. When it comes to optimizing your checkout experience, it’s very important that your are incorporating a proven A/B testing framework. Simpler is usually better, but the specifics of implementation can be tricky to predict. As I mentioned before, this is really simple conceptually. Eliminate errors. Remember that while things might be running smoothly on the Chrome browser in your desktop computer, when you change browsers and devices, errors can pop up, and there are a lot of different devices being used out there. One of Conversion Sciences clients had a strange error that only appeared for Internet Explorer visitors. The spinning “thinking” icon appeared after the visitor selected their state. But instead of disappearing after updating checkout information, a new spinning icon was added. This happened every few seconds. This checkout error only happened on Internet Explorer. Every few seconds, a spinning icon was added to the page. An AB test revealed that this error was costing them $1,500,000 per year. Ouch. Here’s an in-depth look at some of the shopping carts bugs that can popup in your code. It’s easy to forget that “conversion” isn’t the moment someone clicks “Buy Now” on your landing page. It’s not a true conversion until the money has been transferred. Accordingly, we need to view the checkout process as an extension of the landing page, and just like we want to establish and build trust on the landing page and the preceding funnel, we want to continue building trust during the checkout process itself. 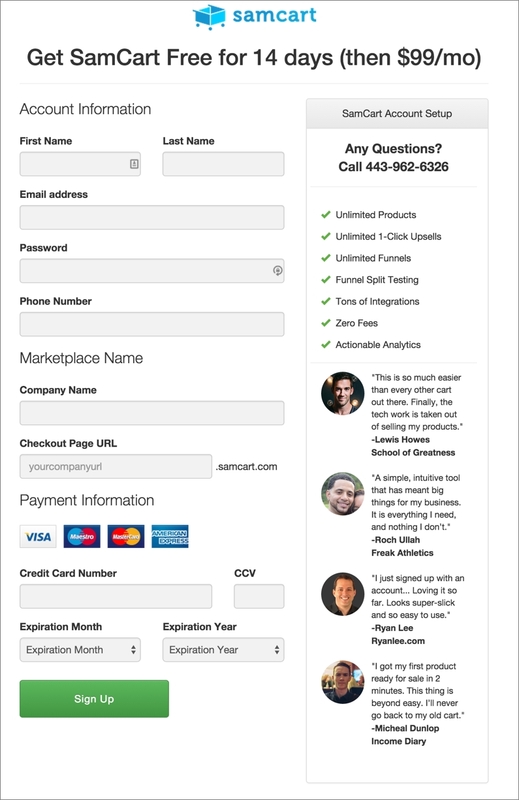 In this example from SamCart, the user is shown a phone number for immediate customer service, as well 4 customer testimonials with included pictures. Instead of just hoping the user goes through with the purchase, SamCart is actively building trust on the checkout page by displaying other customers who were happy with their purchase and reminding the user that if they have any trouble, help is only a call away. The checkout experience is one of the more complicated optimization puzzles you’ll tackle, which is why sound A/B testing is such an instrumental part of the process. I hope today’s infographic has provided with you some insightful ideas for how you can optimize your website’s checkout process and increase revenue for your business. However I found the checkout examples quite old. I would love to see a real comparison between an optimized classical multi-step checkout and an optimized one-step checkout. This newer layout is used in lots of stores, and I have not yet seen a real, fair comparison between both models. Hey Xavier, the one checkout example in #2 is a bit old – was more using it as a quick example to illustrate the point. We’ll try to publish some more up-to-date case studies when possible. It’s pretty hard to get client permission for these types of studies, which is why so few are published. I agree with Xavier. The check-out scenarios are old. A suggestion? Please date your post. It’s an oversight, in my opinion, that WP and similar CMSs don’t let you show a creation date as well as an “updated” date. Also, make users log in first before writing a post. I usually abandon posts that don’t let me know ahead of time that I have to log in first. Susan and Xavier, thanks for your input. The date on this piece is not that old, and I stand by the relevance of our examples. We have grappled with dating our posts. It’s a battle between supporting researchers like you vs SEO penalties vs. hurting our evergreen content. This is what we’re doing now, until we have some data to lead us in a different direction. My evidence is circumstantial, but I believe that Amazon should be listed as one of the top reasons for shopping cart abandonment. Over the past few years my website traffic has increased, but I am experiencing a steady decline in sales. A decline in sales of many of the products I carry followed almost immediately the initial availability of those products on Amazon. People use my website and store to research, then go there to purchase. I cannot profitably compete with their buying power. There’s nothing “circumstantial” when it’s your business! We did a study with one of our clients comparing their Shopify store to their Amazon store. While we didn’t have a statistically significant finding, the conclusion was that it was a wash (equal) when profitability was taken into account. Why did they stay with Shopify? Because that is a purchase experience that can be optimized. Amazon cannot be optimized. With a conversion optimization program, this client will improve conversion and profitability over Amazon. But they won’t fire Amazon. You might consider selling through Amazon as well, while you offer a more customized experience through your website for those that will pay for the extra attention. Multivariate Testing: Promises and Pitfalls for High-Traffic Websites What Is Behavioral Science and Why Is It Critical For Conversion?